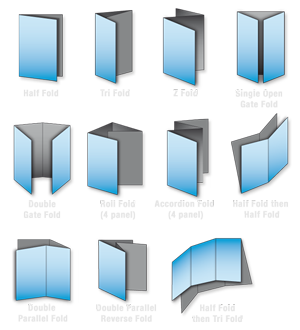 For Brochures, this refers to the number of "pages" (or "panels") after folding. You can find more information on Artwork Orientation & Page Set-Up as well as Folded Products. For exact specifications (dimensions, position of fold lines), please download the respective File Template. Also see Artwork Orientation & Page Set-Up. Aqueous Coating: Aqueous Coating is a non-toxic, smooth waterbased coat that gives the paper a slight shine and makes colors more vivid. It also deters dirt and fingerprints. Our folded brochure printing service provides a fast and affordable service for small businesses and others who need printed marketing materials. Using our knowledge and experience, we are able to cut costs for cheap brochure printing that still produces high quality results. Our brochure printing service uses a wide range of printing materials from the most affordable to the highest quality to provide the most versatile business brochures printing service possible. We strive to stand out among business brochure printing companies, and our goal is to provide promotional brochures that perfectly meet the requirements of our customers. Do not confuse cheap brochure printing with cutting corners on quality or effectiveness. Our brochure printing service streamlines the process and cuts out extraneous costs to provide affordability while still producing a quality product. * Business brochure printing. We tailor our services to the needs of businesses to effectively promote their goods and services. * Cheap brochure printing. 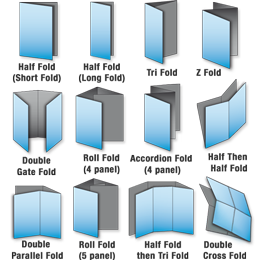 We offer competitive rates on all our business brochure printing services. * Free brochure printing templates and file preparation support for folded products. For more information on cheap brochure printing, please contact us.